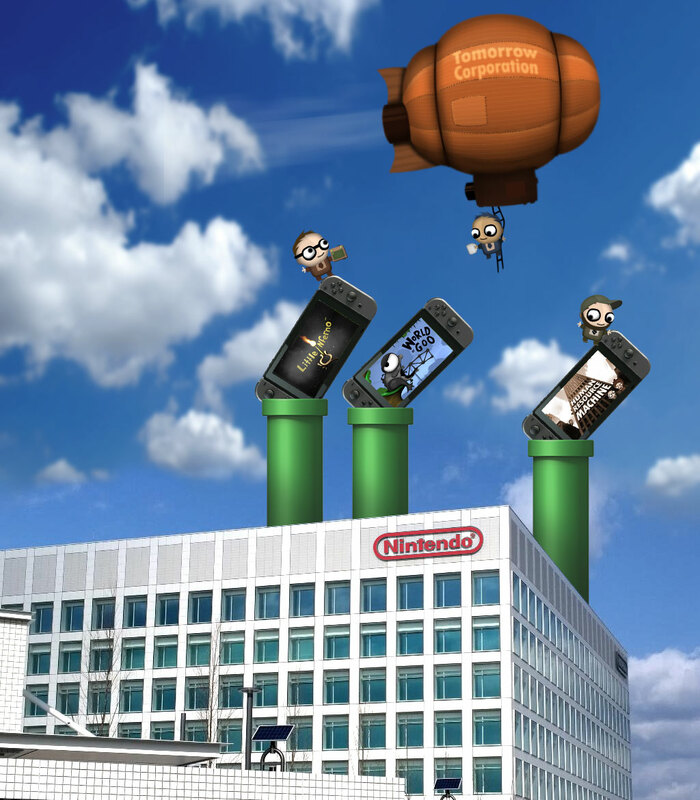 An actual photo of Nintendo receiving Tomorrow Corporation’s three Award Winning Games. Good news from the Mushroom Kingdom! We crammed our 3 games down Nintendo’s warp pipe, and are now just waiting for approval. We hope to have a release date for World of Goo, Little Inferno, and Human Resource Machine soon! No one at Tomorrow Corporation actually has a retail Switch yet. While we were working on our titles, we all forgot to pre-order the Switch until it was too late! How’s the eShop looking? More seasons of Great British Bake Off are now available and we have begun new careers in baking. I can’t wait to get your games on my Switch! It’s the exact same games or can we hope for a bit of new content? I can’t wait for these games. I loved Little Inferno on the Wii U. This will be a great chance to play the other two. For now This Zelda game will have to do. Not to sure about it, doesn’t have enough burning things for my liking. Checks review scores. Well… that’s, that’s quite good. Awesome!!! As soon as it’s on the eshop, I’ll be picking up World of Goo! Can’t wait to experience the magic of that game all over again on a new platform! Slightly annoyed that these were advertised as launch titles and you’re not making any mention to that but oh well… I’ll still buy them when they come out. I’m sorry you weren’t there day one, but it gives me a reason to keep checking the shop, which is otherwise pretty empty (as of yesterday). Oh, and a huge congratulations for Human Resource Machine, truly a splendidly different game. I was really bummed to see your games not make release day. Hopefully this means they will be in the eshop ASAP.! That’s great news congrats and thx for the good work ! Will you sell the 3 games separately only or also in a bundle ? Can’t wait! Keep up the good work, guys! Really looking forward to your games coming to the Switch too! I loved World of Goo and can’t wait to play your other games as well. Congrats on the award. The eShop is bare bones right now with 2 games being added today… which makes 11… at least in America. Has Nintendo Given you any rough window or estimate of time?